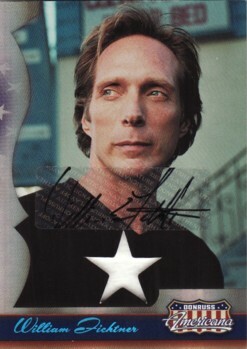 Donruss Americana certified autograph card of actor William Fichtner (known for dozens of movie and TV roles including Armageddon, Black Hawk Down, Crash, Go, Invasion and Prison Break) with a swatch of shirt he actually wore. #147 of only 250 cards produced. ONLY ONE AVAILABLE FOR SALE.